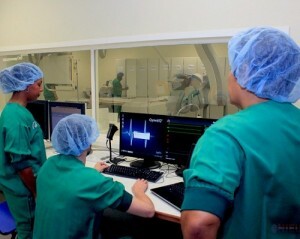 WILLEMSTAD - The Heart Center Curaçao was officially opened at the Saint Elizabeth Hospital (Sehos). Since early this year as cardiac catheterization and percutaneous angioplasty can be performed. Heart patients no longer need to go abroad for these procedures. According to interventional cardiologist De La Fuente they have already performed forty procedures this year. Soon the implementation of a particular type of pacemaker will also be possible. The Heart Center works closely with the Catharina Hospital in Eindhoven, the Netherlands. The center has six beds. The first plans for the heart center date back to 2008.